There are many different requirements to be considered a veteran of touring, and this year’s Gen-X Summer Tour is no exception. Buckcherry, P.O.D., Lit and Alien Ant Farm all hail from various places in California – Anaheim, San Diego, Fullerton and Riverside, respectively – and formed their present-day bands in the early 90s. They’ve seen success, failure, lineup changes, record labels, tour buses, radio play… they’ve created a rewarding career for themselves and more than two decades of memories for their fans. 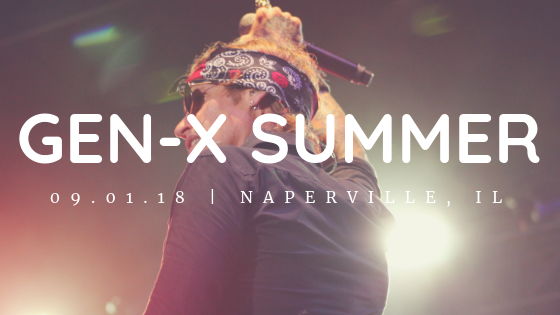 The Gen-X Summer Tour made a stop in Naperville, IL and made a point to show the suburbs that Chicago isn’t the only place that can rock. First on the stage was Alien Ant Farm, whose rise to fame included a cover of Michael Jackson’s “Smooth Criminal”. 17 years since the song’s release and lead vocalist Dryden Mitchell still sounds exactly the same, in the best way possible. Their performance started out small and grew immensely by the time that recognizable guitar riff blared through the speakers. It’s no surprise to Lit fans that their stage presence is as vibrant as ever. Their musical evolution has changed quite a bit since “My Own Worst Enemy” was released in 1999 – their latest album, These Are The Days, was their country music debut. From the constant smiles on each member’s face to the crowd’s sing-along chants throughout each song, this is a band that still brings their all to each and every show. P.O.D. is a force to be reckoned with in terms of performance. The minute they stormed the stage with “Boom”, it was nonstop entertainment from beginning to end. Frontman Sonny Sandoval spoke of new music being released later this year and the crowd’s response couldn’t have been more positive. Their performance experience does not go unnoticed, and neither does their passion for music. By the time Buckcherry took the stage, the crowd was more than ready for their set. Their high energy did not slow down and their polished sound rang from song to song. Like the bands before them, their stage presence was mesmerizing and the amount of talent from each member radiated far beyond their spot on stage. Generation X’s taste in music was both loud and varying in genre. Their love for these bands has stuck with them far beyond the 90s and continues to support the kind of music that just can’t be replicated. The Gen-X Summer Tour is everything fans loved about the 90s and everything that Buckcherry, P.O.D., Lit and Alien Ant Farm still stand by today. Full photo gallery found here.